What can be better than killing two birds with one stone? How about hiking to two glaciers in one day! 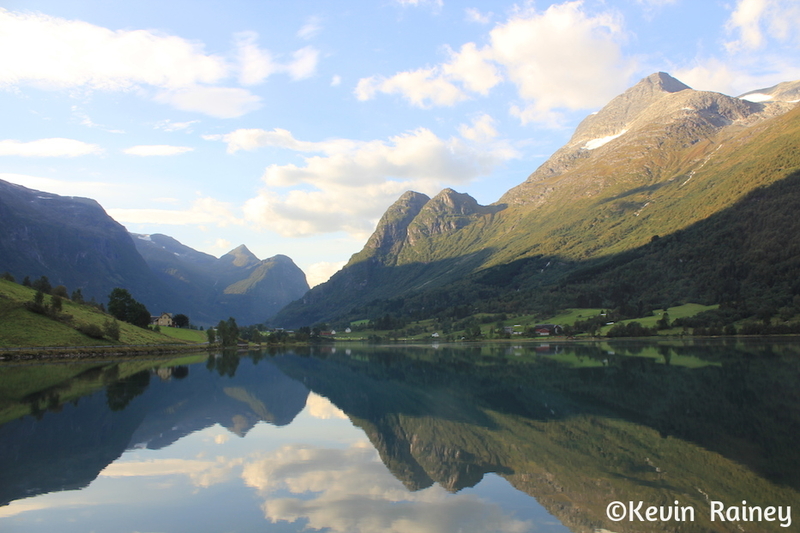 That’s exactly what I would be doing today near Olden, Norway. 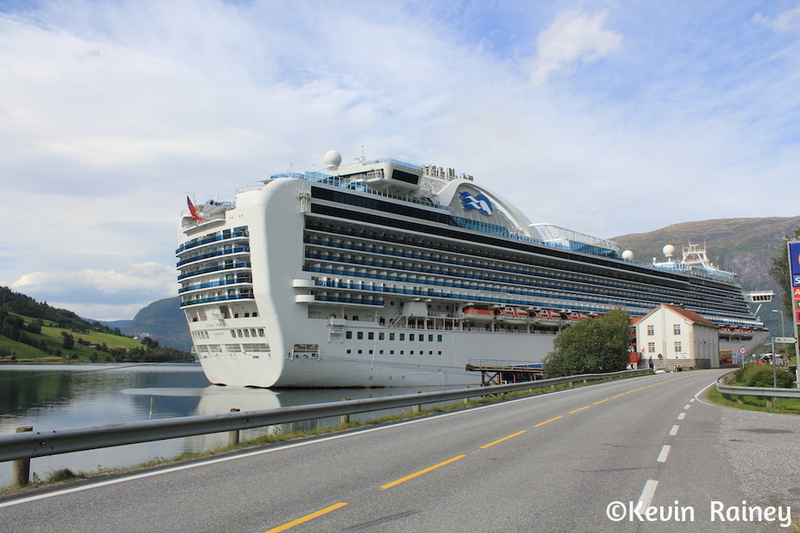 The Crown Princess arrived in Olden around 7 a.m. Olden is a very small town in Sogn og Fjordane county located on the southern shore of the Nordfjorden. 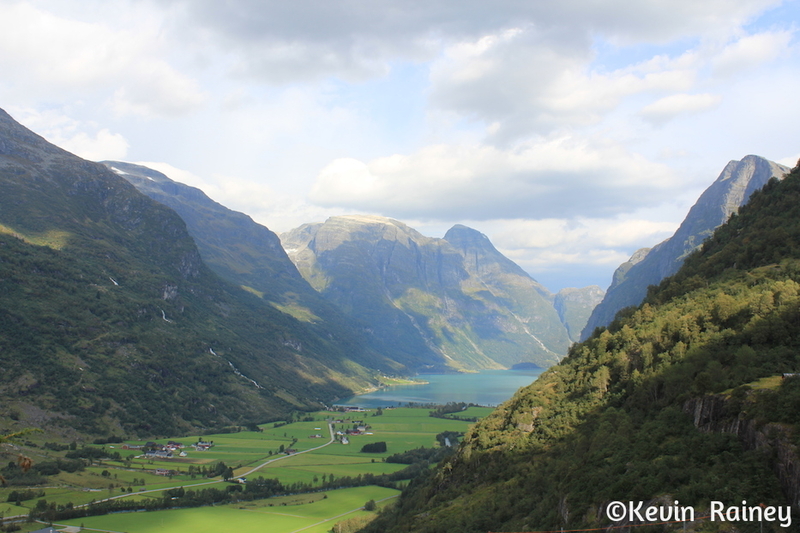 At 66 miles long, Nordfjorden is the sixth-longest fjord in Norway. It encompasses the Jostedalsbreen, mainland Europe’s largest glacier. This area is popular with both skiers and fishermen. 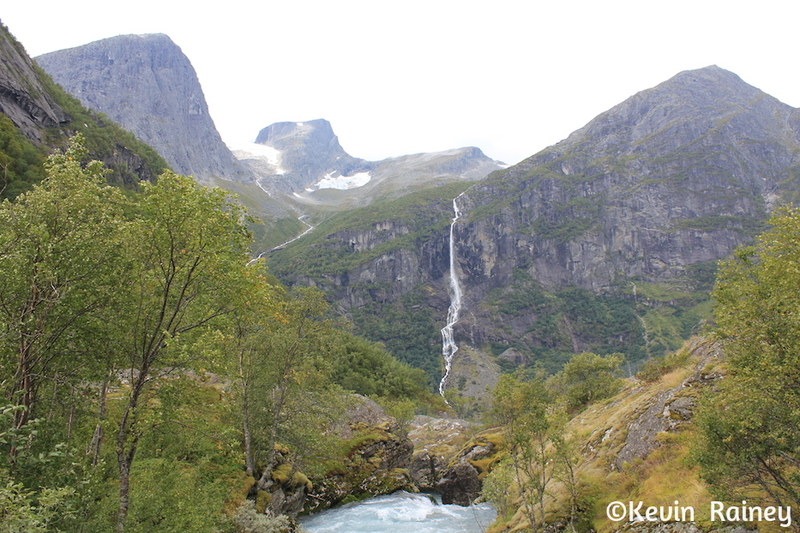 Around 9 a.m., my brother and I boarded a coach from Olden harbor which took us along the Oldeelva river into the Oldedalen valley. 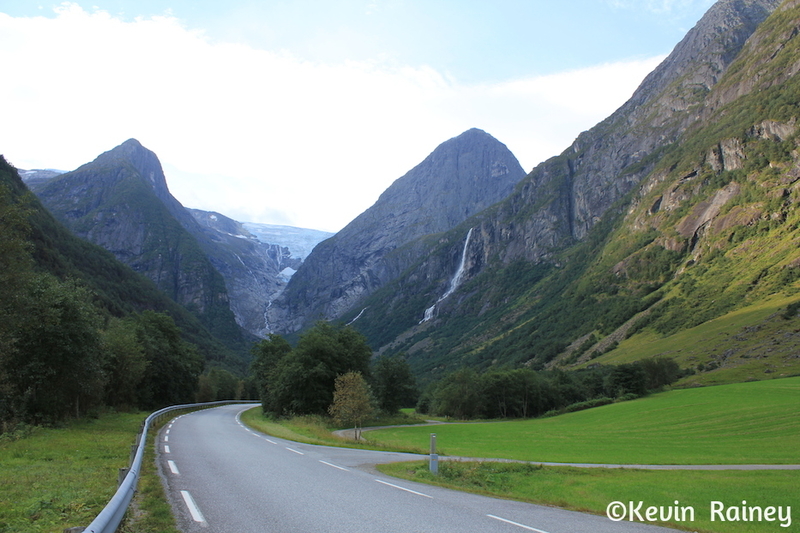 Our local Norwegian guide told us all about the area as we drove through the beautiful meadows. He pointed out the William H. Singer home and gallery. The famous American artist painted many renown landscapes when he lived here. During this poor period in Norwegian history, Singer also funded a road and a regional hospital for the people of Olden. Artists of the Romantic movement in the 19th century inspired travelers to come explore the dramatic landscapes here. Just like travelers of that period, we were all overwhelmed by the beautiful contrasts of the monumental peaks and glaciers towering above the rural homesteads. Photo from my bus seat! 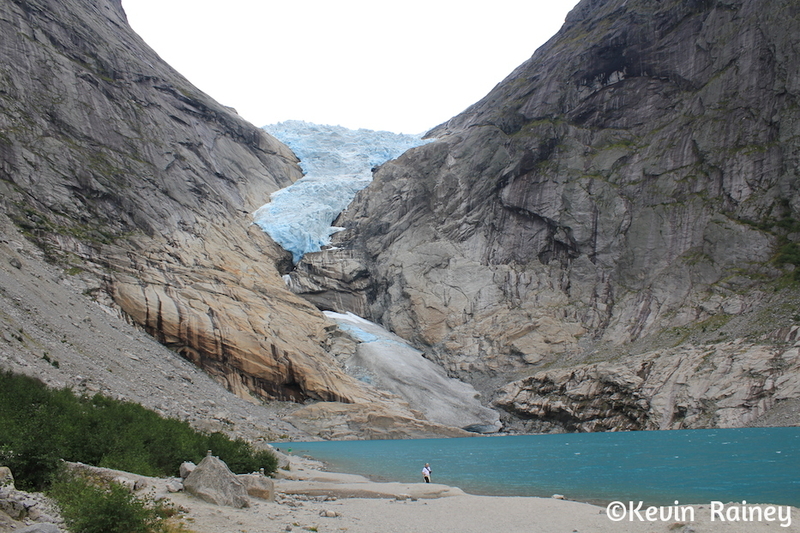 We were stoked to hike two of Norway’s most stunning glaciers in Jostedalsbreen National Park. 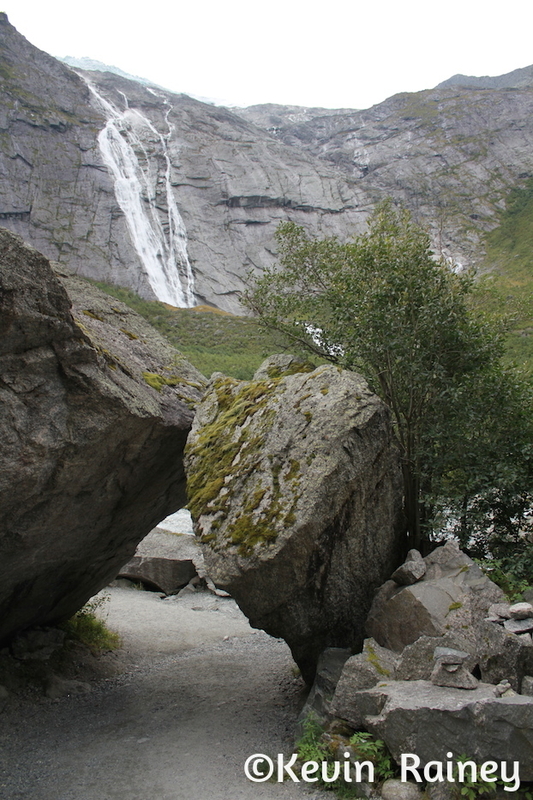 The park surrounds the enormous Jostedalsbreen ice field. 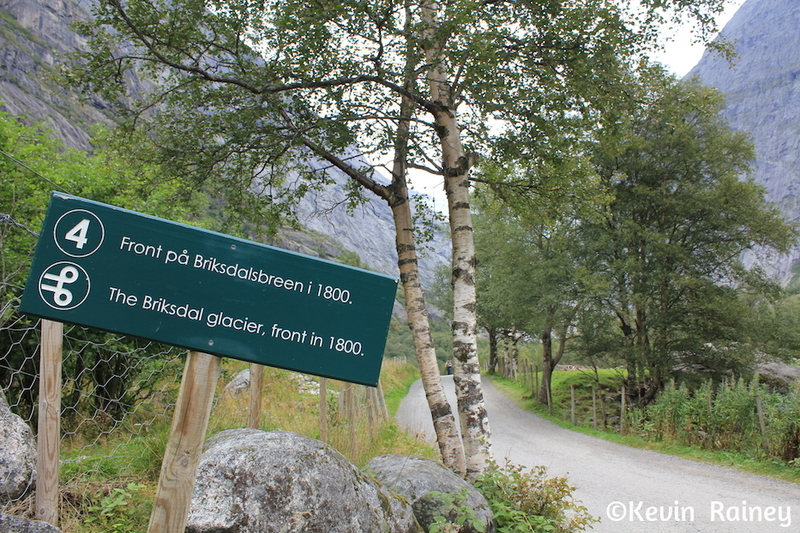 The Jostedalsbreen, together with smaller separate glaciers, covers about 310 square miles of the park. 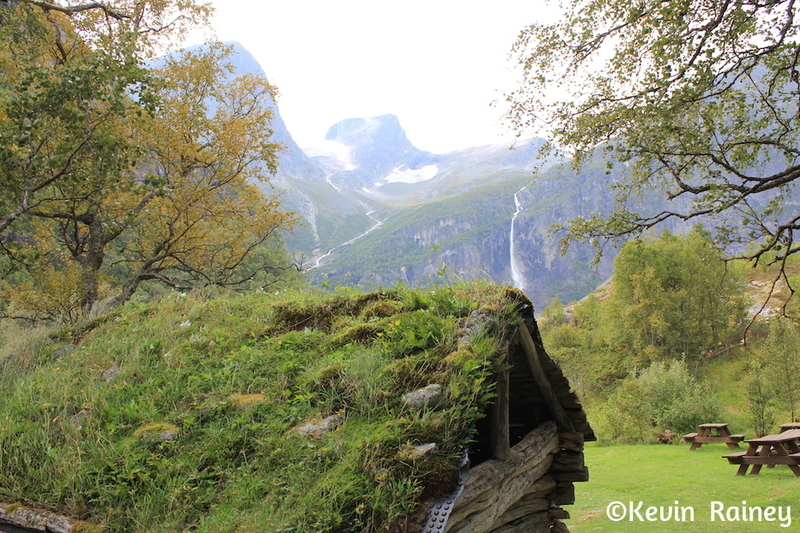 Our first hike began near a farm in the lush Brenndal Valley. 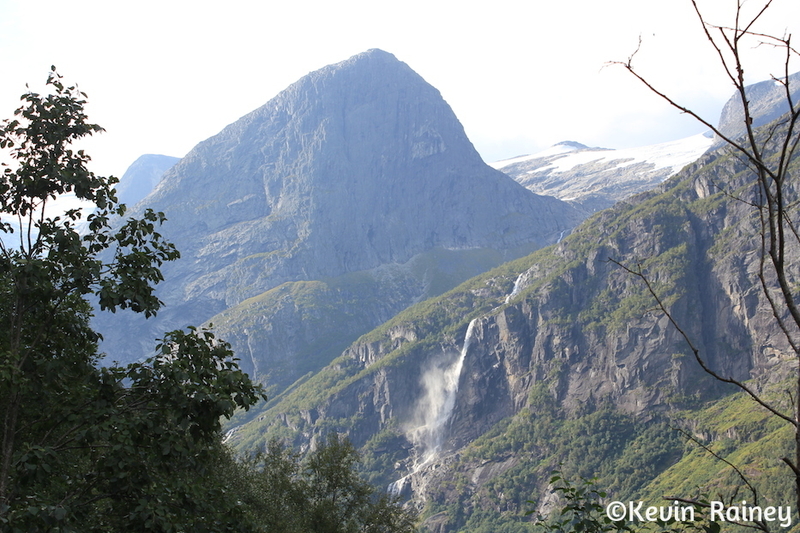 We followed our guide for the first 45-minute hike up Brenndal Valley. 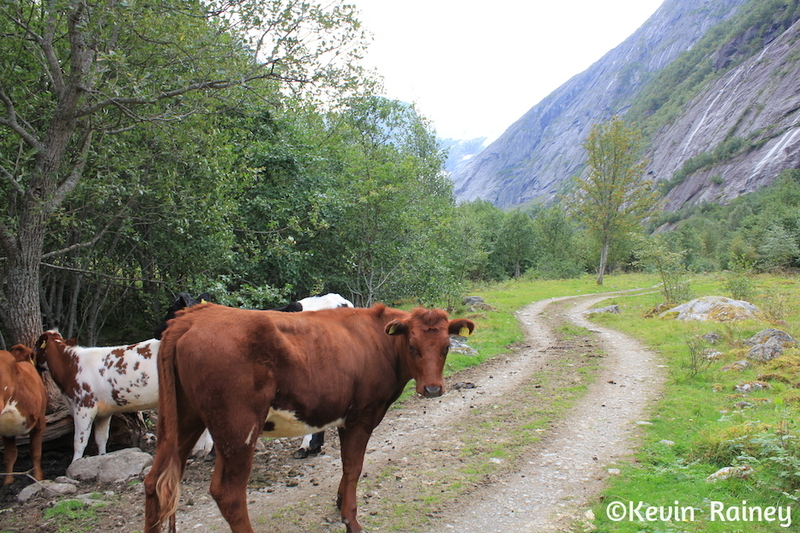 Along the way, we met a herd of cows that were curious about why we had invaded their path. 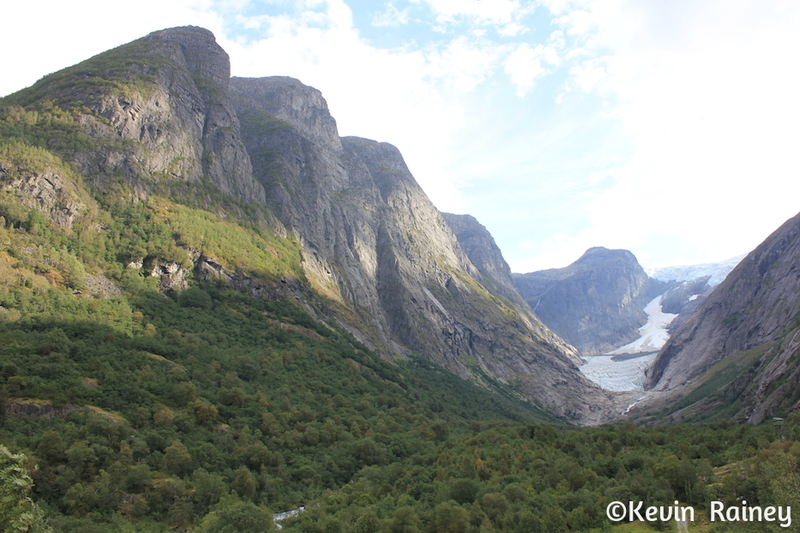 The surrounding peaks were gorgeous and we had a magnificent view of the Melkevoll Glacier and valley below from an amazing overlook. 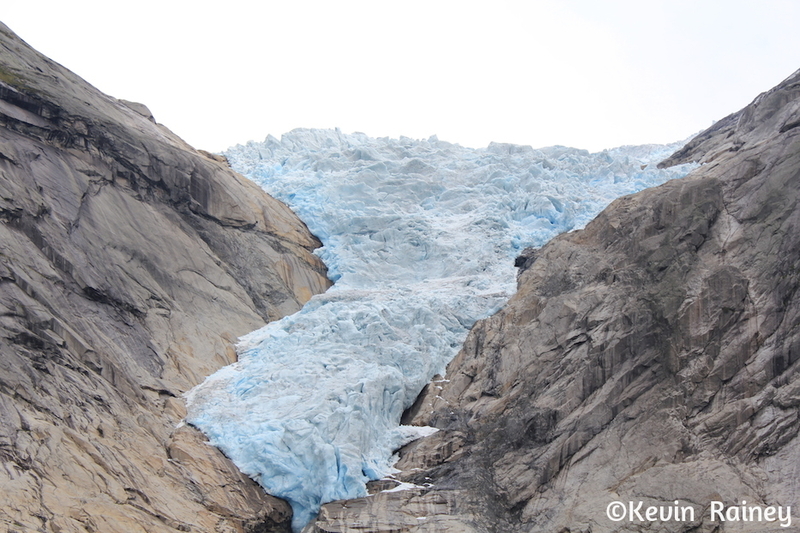 We also hiked close to the tremendous Brenndalsbreen glacier. 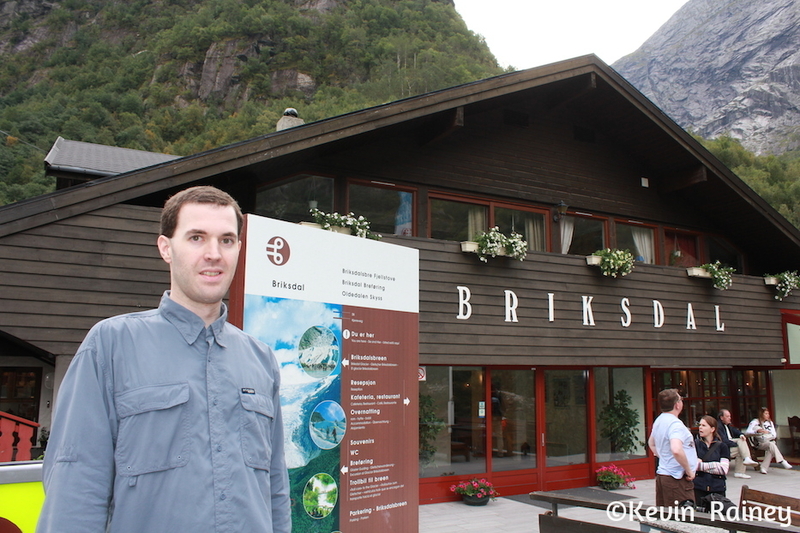 Upon return to the coach, we drove to the charming Briksdal Inn. We enjoyed a delicious two-course lunch of Norwegian salmon and dessert before touring the Nordenfjord Visitor Centre. 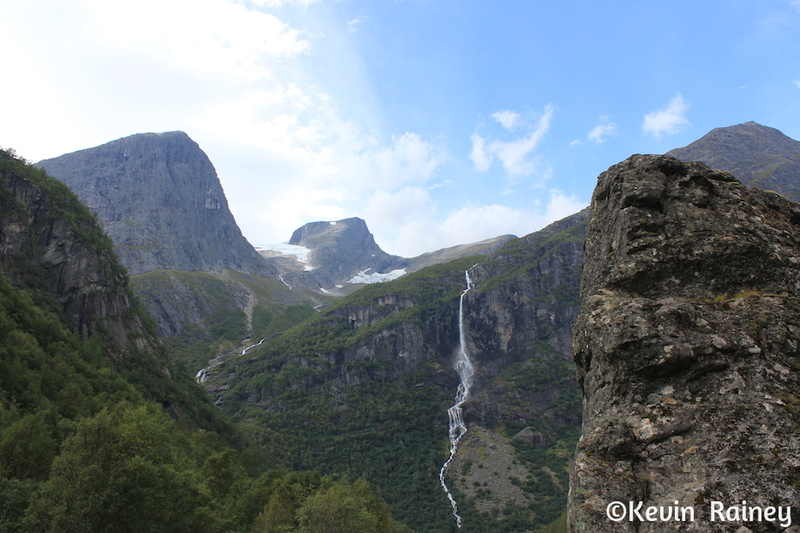 Then my brother and I embarked on a 45-minute hike to the Briksdal Glacier. This valley is one of the most beautiful hikes I have ever encountered. Even the goats and sheep seemed to be completely at peace grazing here. 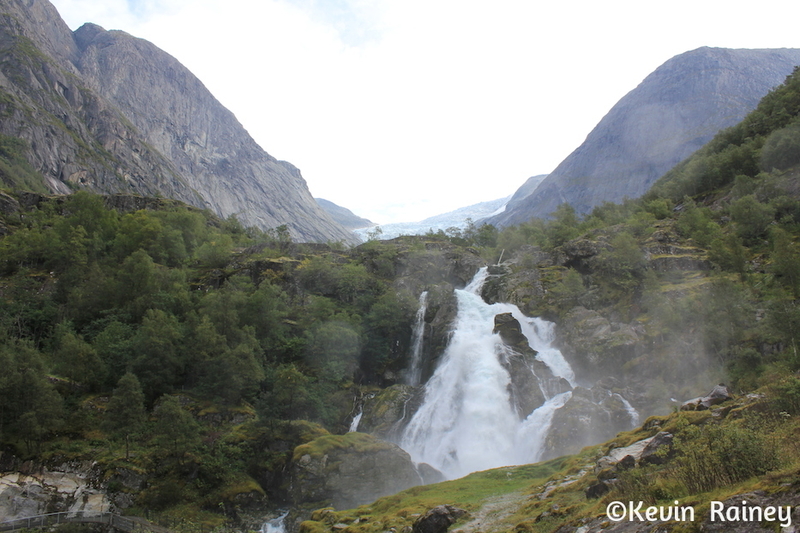 Around every turn seemed to be mighty waterfalls roaring by us or high above on the cliffs. As we approached the Briksdalbreen (Briksdal Glacier), we admired a dance of blue and turquoise light reflecting off the surface. A strong wind from the glacier created waves and rapids formed as the resulting river tumbled down the valley – in fact, you could go rafting here! We had a fantastic hike before rejoining our coach for the scenic drive back to Olden. After our return, we bought some postcards in town before re-boarding the Crown Princess. The ship departed Olden around 17:00 p.m. and we went to the ship’s buffet for the first time this trip for dinner. Later in the evening, I went to the gym for a workout. This gym was high tech with almost every kind of cardio theater equipment. 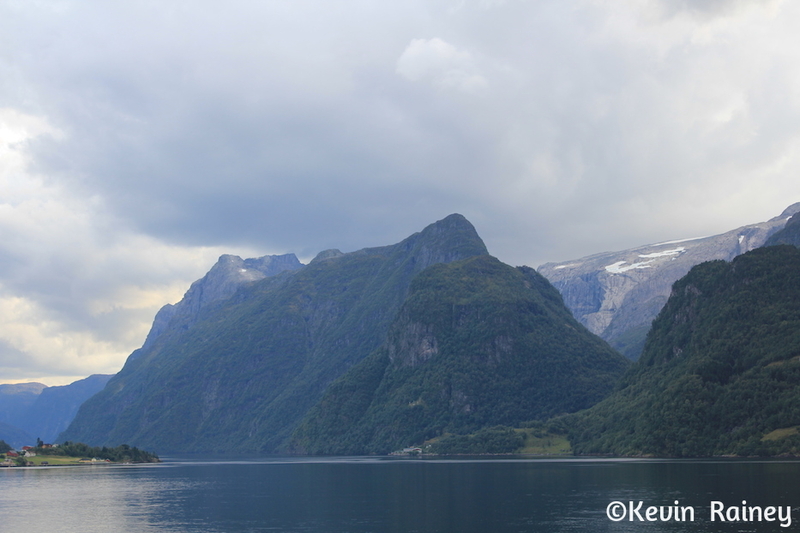 But nothing could beat the view of the Nordfjorden outside as we cruised onwards to our next destinations: Fläm and the Sognefjord.